I am working with CoreData, on an entity called "RoleName". The problem is: I click on "Create NSManagedObject subclass" from within my model, and so it automatically creates the classes for my entity. even though I don't have any other class with the same name. This is because Xcode handles all that by itself. I felt it like a bit of trouble as the auto generated classes don't have all my properties. Delete what ever classes you already made for core data. 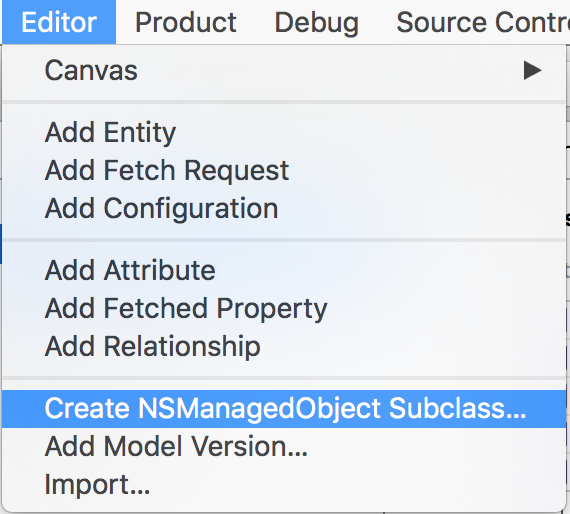 Manual/None is the default, and previous behavior; in this case you should implement your own subclass or use NSManagedObject. Category/Extension generates a class extension in a file named like ClassName+CoreDataGeneratedProperties. You need to declare/implement the main class (if in Obj-C, via a header the extension can import named ClassName.h). 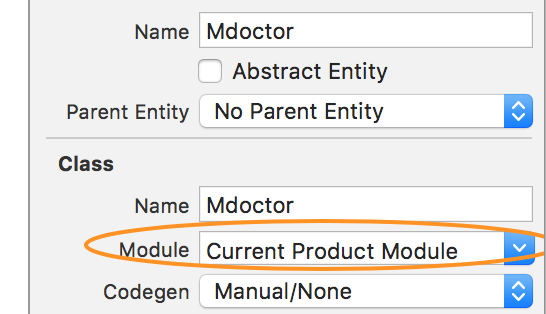 Class Definition generates subclass files named like ClassName+CoreDataClass as well as the files generated for Category/Extension. The generated files are placed in DerivedData and rebuilt on the first build after the model is saved. They are also indexed by Xcode, so command-clicking on references and fast-opening by filename works. You don't need to manually create subclasses for NSManagedObjects. I would suggest that you delete the files that you created with NSManagedObjects (Move them to Trash) and go to every entity in the DataModel Inspector under Codegen select : Manual / None and create than the Subclasses. Not the answer you're looking for? Browse other questions tagged ios swift core-data nsmanagedobject or ask your own question. Use NSManagedObject class without initWithEntity:?